Today, we're going to install a zipper for the maximum expansiveness of an opening. That's fancy for "so your bag will open so wide that it will look as if the zipper wasn't even there". There are many ways to do this, including zipping-around-the circumference of the opening itself, which we will learn later in this series. 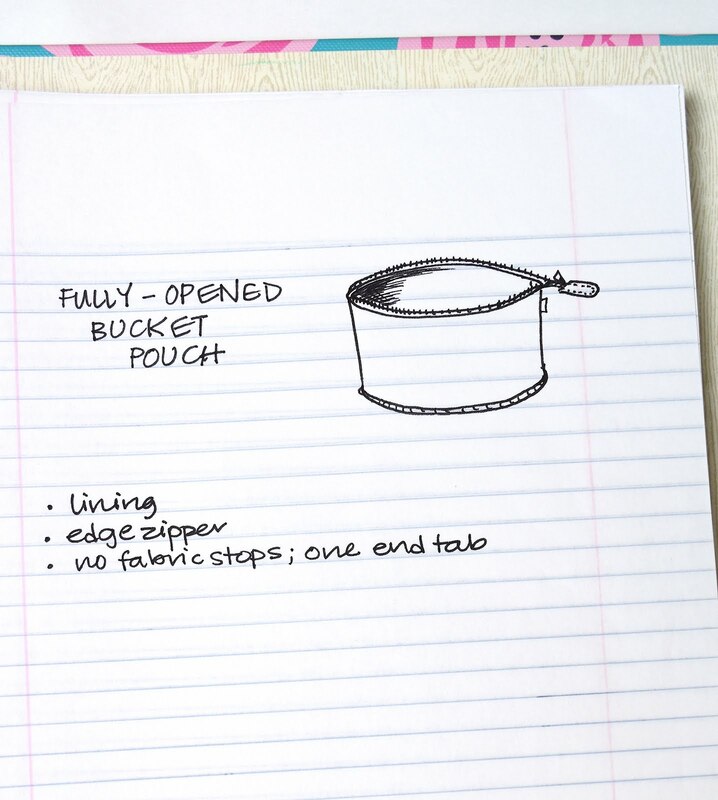 But let's continue with the much simpler zipper-along-the-edge design, and make a basic bucket pouch. 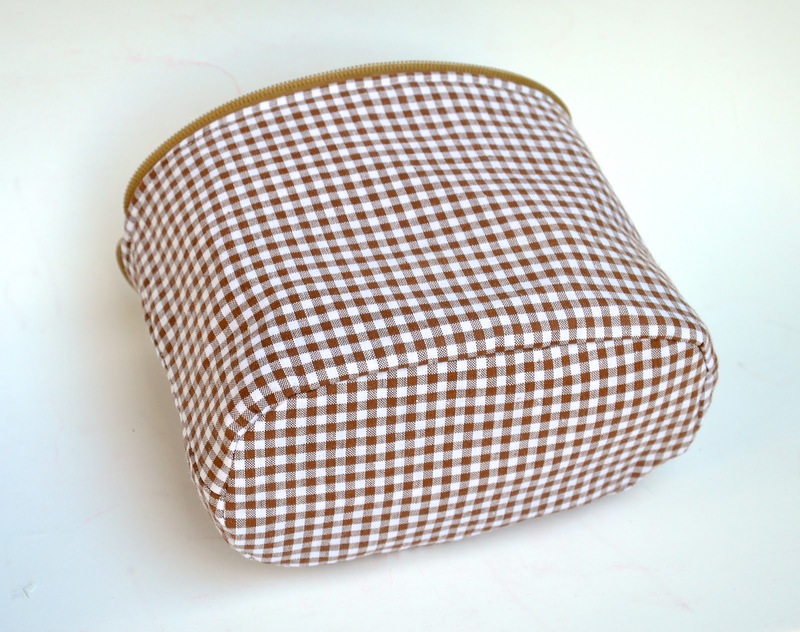 and a brown gingham for the lining and accents. 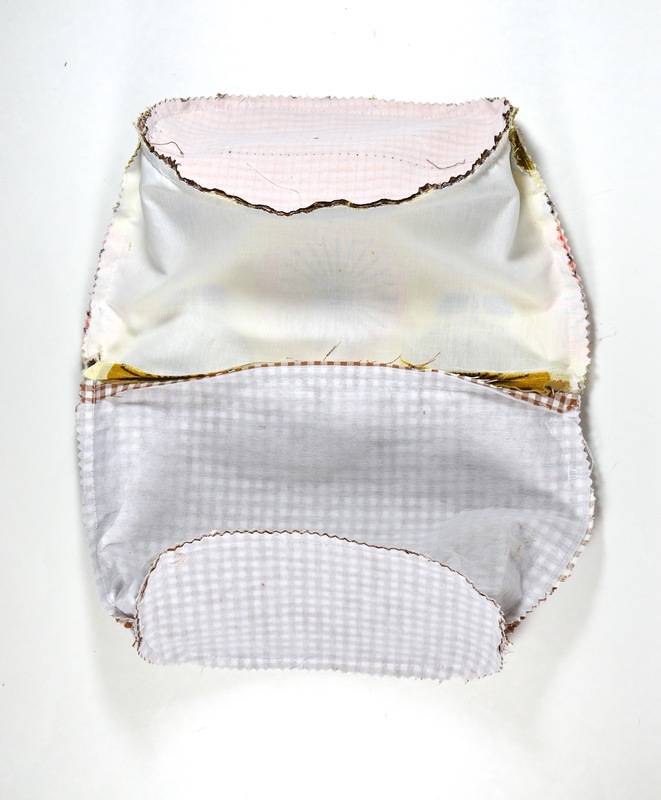 When unzipped, the pouch opens fully, with no constraints at either end of the zipper. 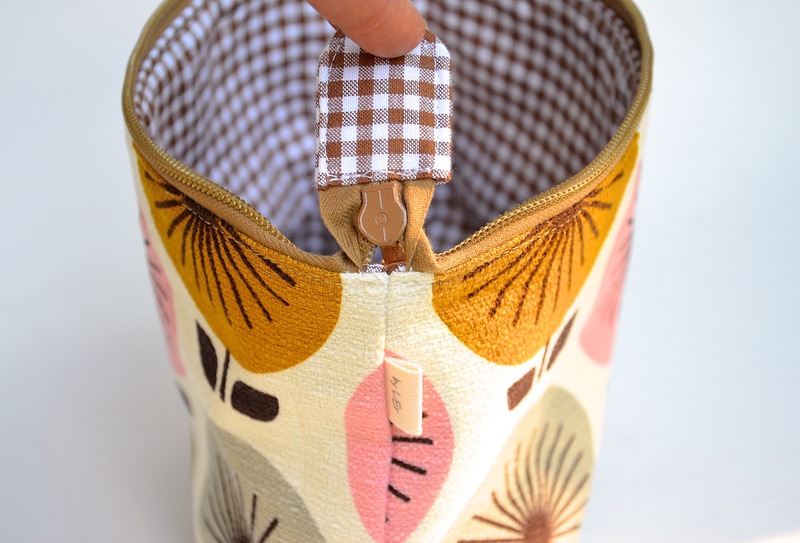 The principle for making such wide openings is simple: span the entire opening with zipper coils/teeth; don't waste any of that space with fabric stops. 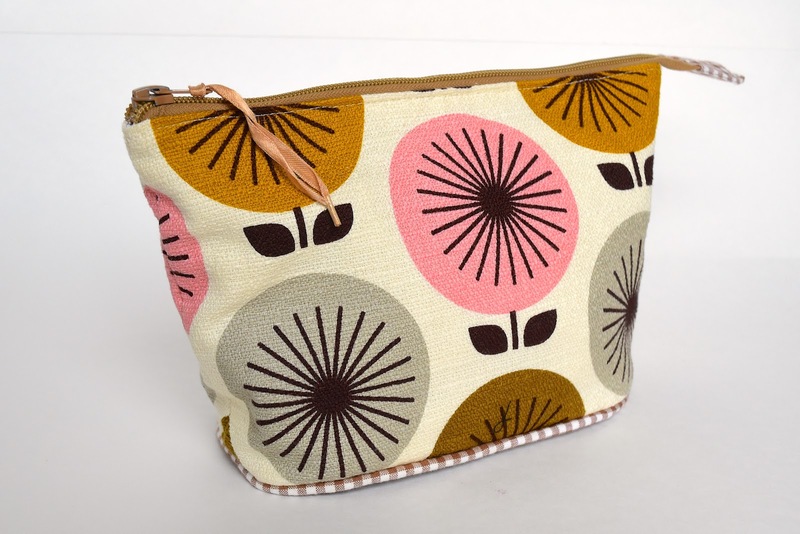 This design, incidentally, like the ubiquitous flat-edge craft fair zippered pouch, is all over the internet. Seriously. Like "throw a virtual stone and hit one million of them" all over. And it's just as ridiculously easy to make. Although that's not why we're making it today. Today is just a dry run for the next chapter, which is a bag. Which is the real point of this series, isn't it (I mean, there's a reason for why it isn't called Zip-A-Pouch)? 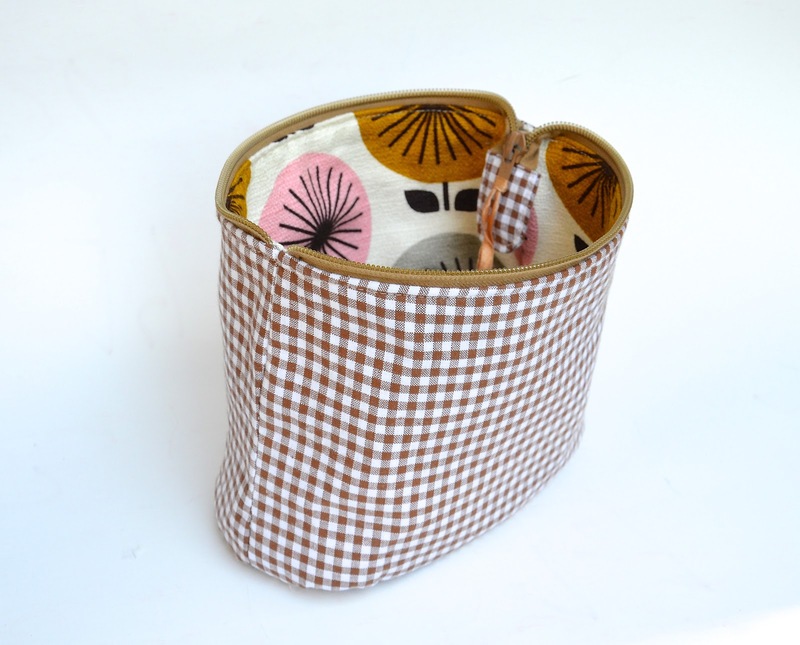 one zipper, at least 2" longer than the finished length of the pouch. other features you want to add - straps, zipper pulls, etc. 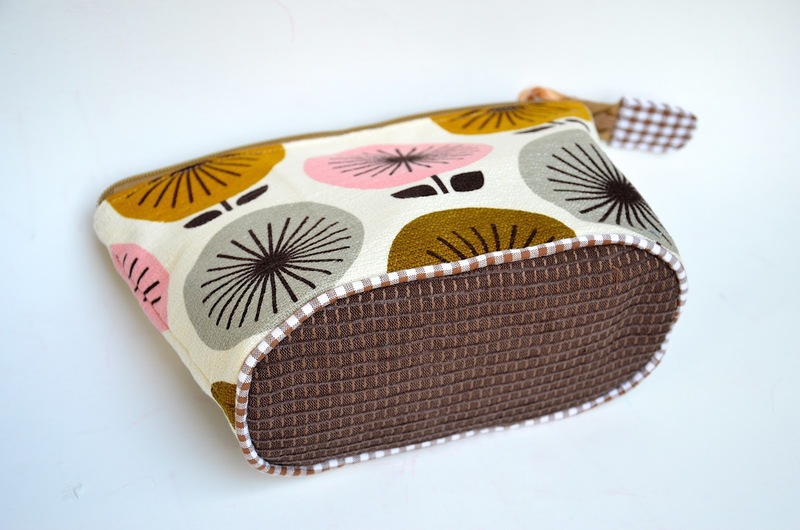 (I added piping and a fabric stop, not shown in the photo below). 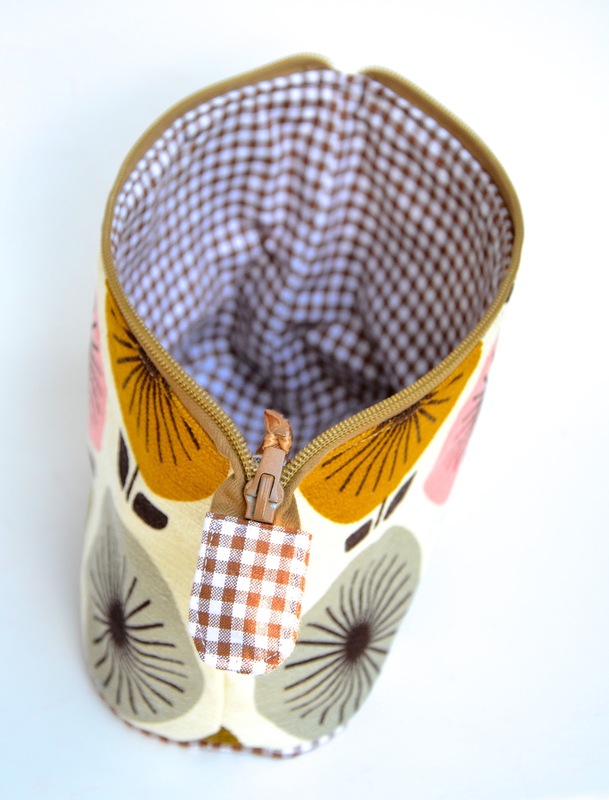 When you install zippers this way, it is usually a lot easier to use a separating zipper. If you have one. If not, a regular zipper works perfectly well. 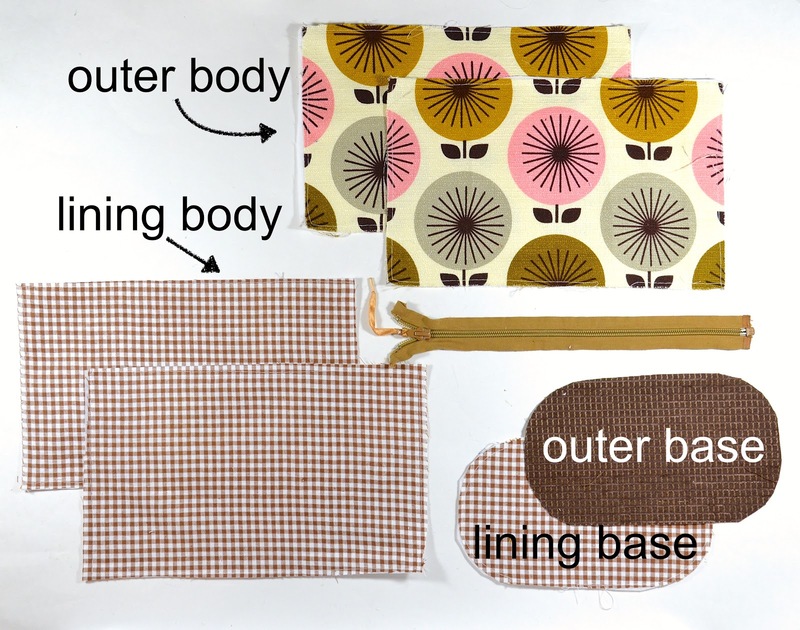 I'm using a separating zipper in this tutorial, but I did not separate the halves at all during the construction, just to show you that it can be done without. Step 1: Mark the boundaries of the opening. 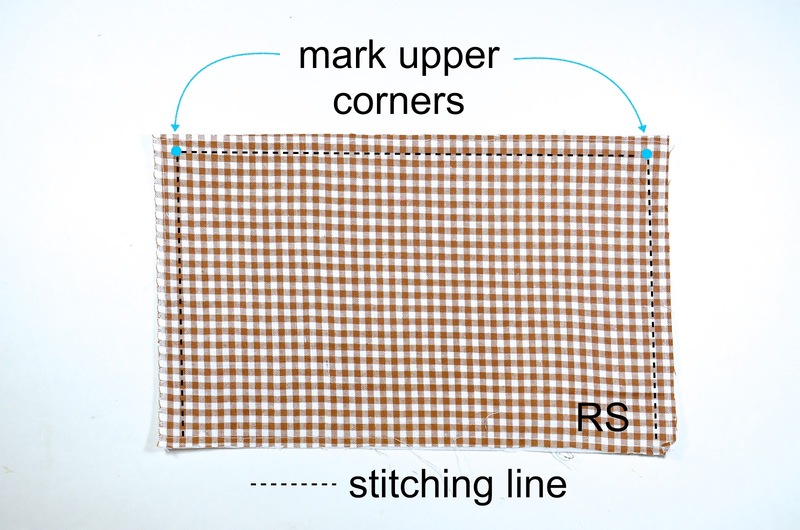 On one piece of lining, mark the exact end points of the zippered opening. 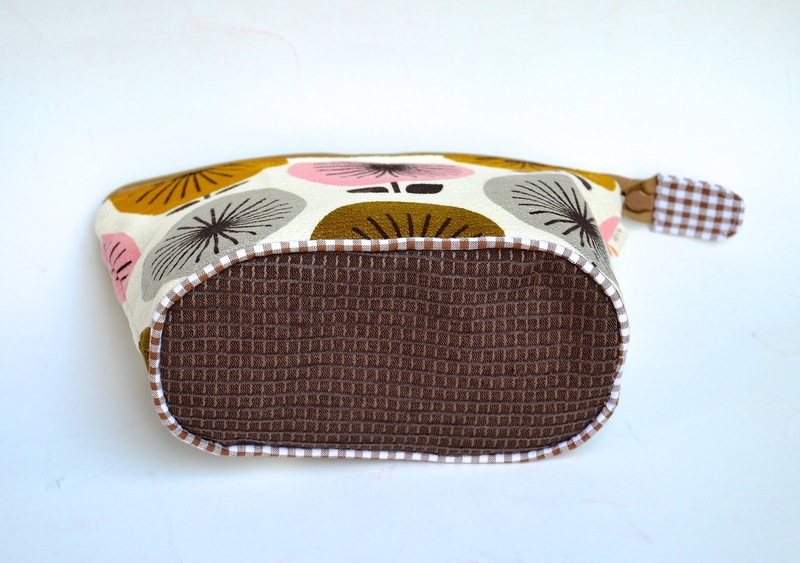 I put dots where the stitching lines intersected the sides and top edge. At its head end, curve the coils toward the corner dot. so that its coils touch the dot, as shown. Begin the curving process about 1/2" away from the dot. At its tail end, curve the entire zipper tape away from the dot, so the basting stitches run off the tape, as shown. Begin this curving process about 1/2" away from the dot. 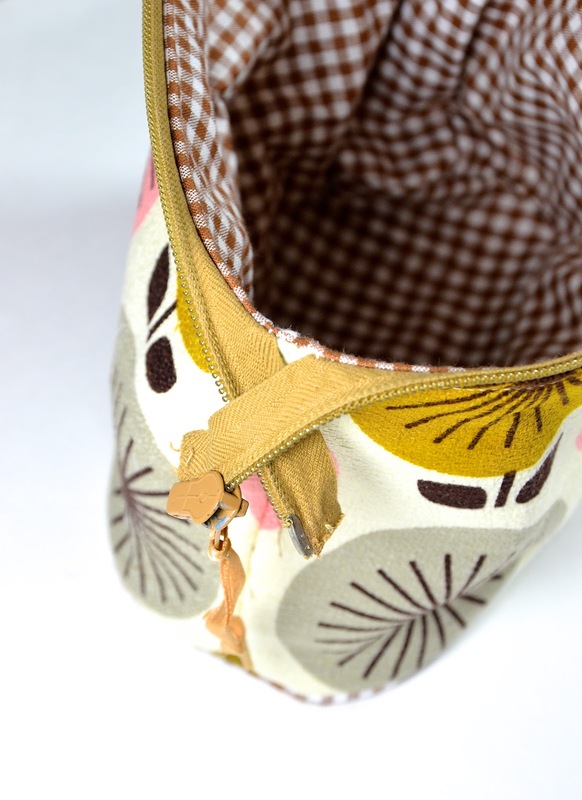 The head end of the zipper tape thus shifts into the SA region of the fabric and, in the finished pouch, will be hidden in the seam. 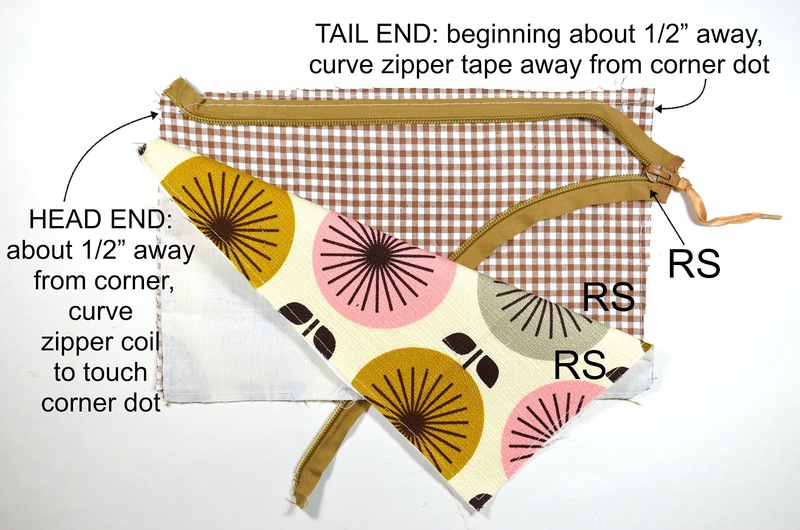 The tail end of the zipper tape thus shifts out of the SA region of the fabric and, in the finished pouch, will remain exposed to accommodate a fabric tab. Right, let's finish up the construction, then. Step 2: Add the outer fabric to finish facing that zipper tape. 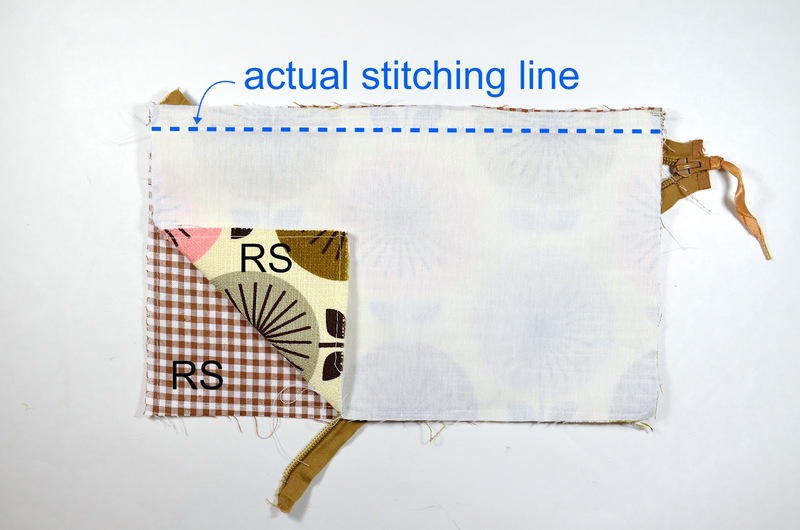 With RS together, sew along the stitching line to sandwich the zipper between the two fabric layers. One side of the zipper tape is now faced. 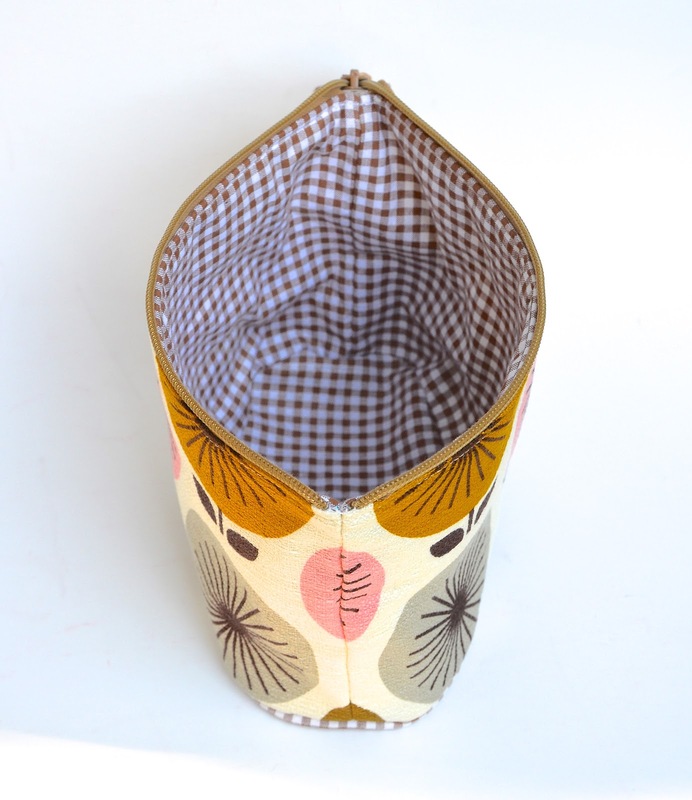 Here is what it looks like with the fabric layers turned RS out. 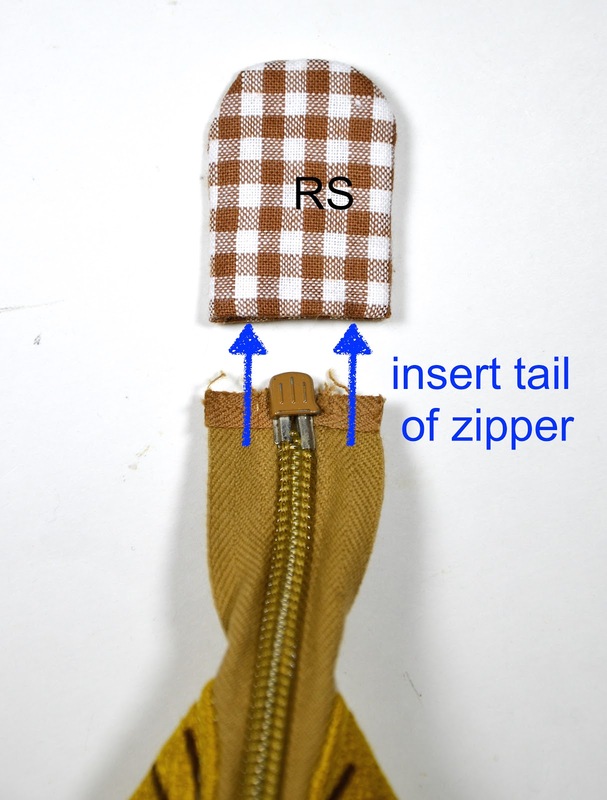 Note how the head end of the zipper tape disappears into the seam and the tail end of the zipper tape emerges out of the seam. Step 3: Repeat Steps 1 and 2 to face the other side of the zipper tape with the remaining outer body and lining body fabric pieces. 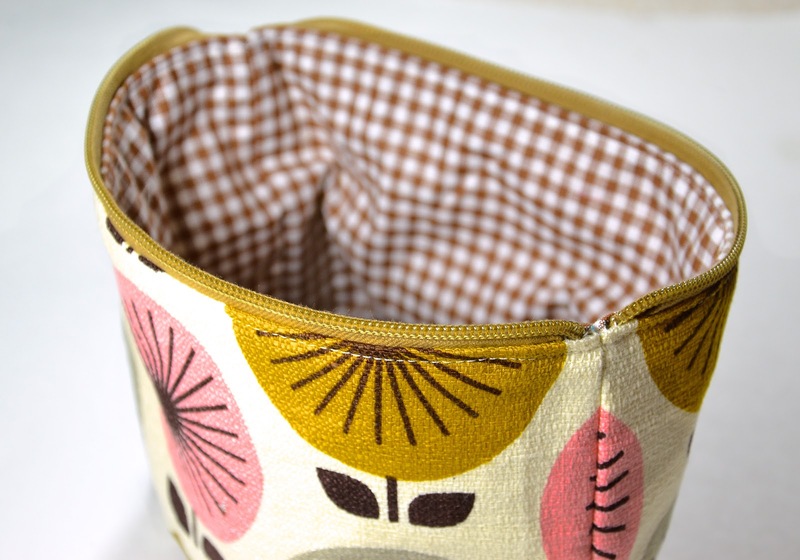 From this point on, we will assemble the pouch as we would any other regular lined pouch. Step 4: Pair the two outer pieces (RS together) and the two lining pieces (RS together). Step 5: Sew the two side seams, pushing the tail of the zipper out of the way of the stitches. You will now have two separate "pouch wall" structures - one lining and one outer - connected only at the zipper. 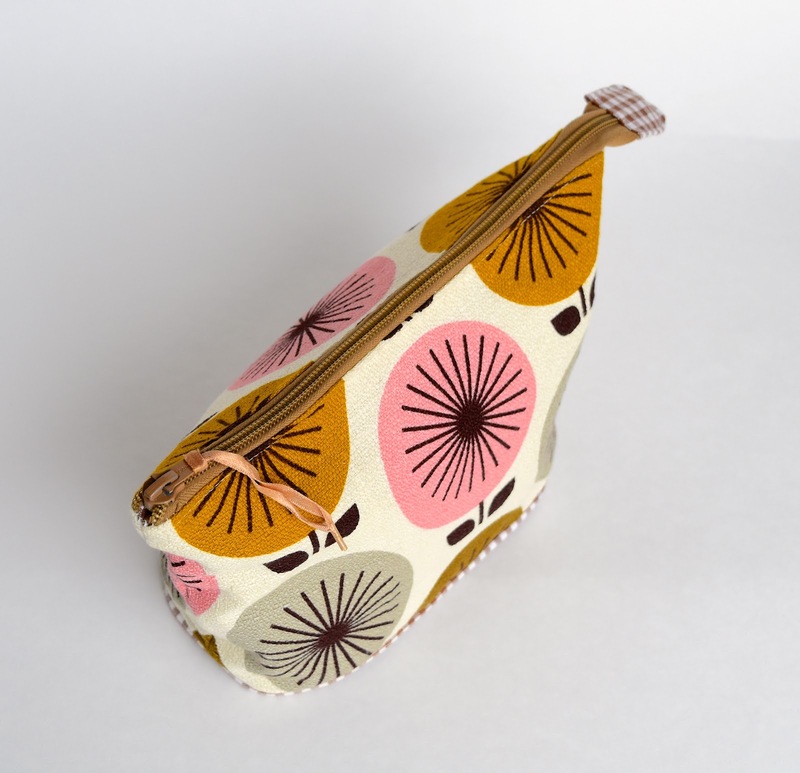 You will need a gap in one of the lining seams for turning the pouch RS out later; leave it in a side seam or the base seam (next photo). Step 6: Separately attach the bases. I left that aforementioned gap in the lining's base seam. 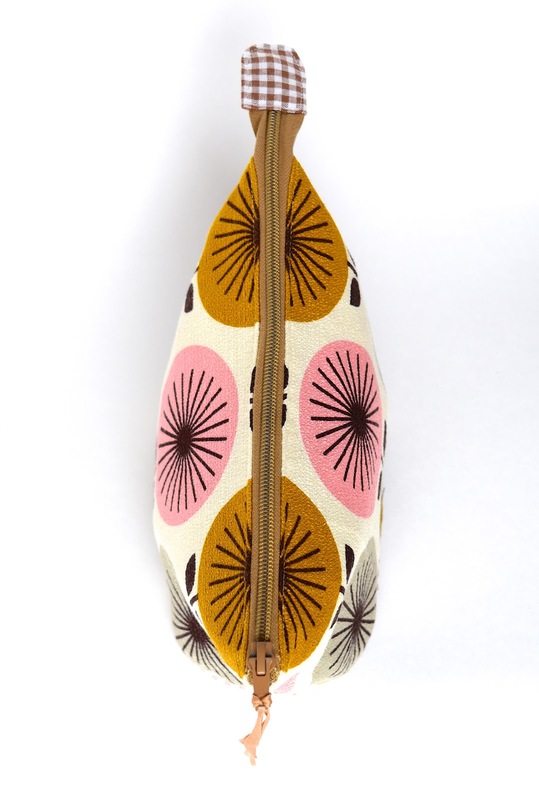 You will now have two separate pouches attached only at the zipper. 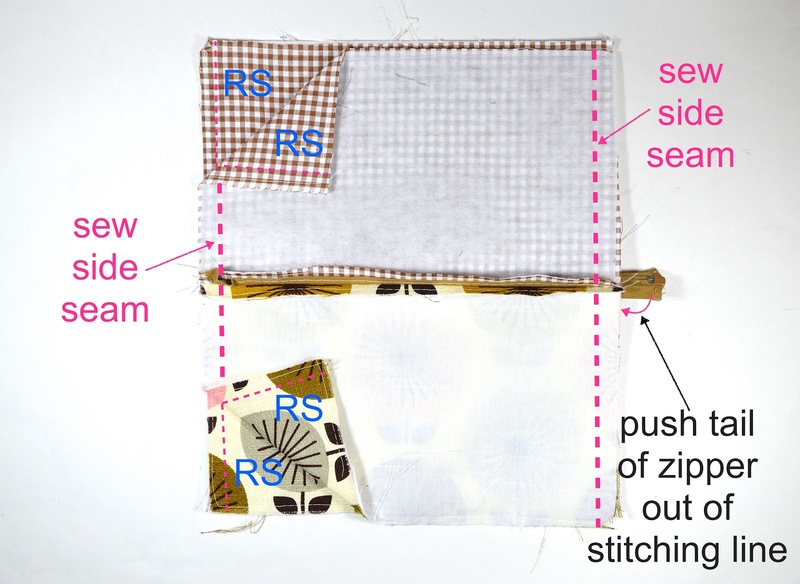 Turn the entire pouch RS out through the gap and stitch shut the gap. 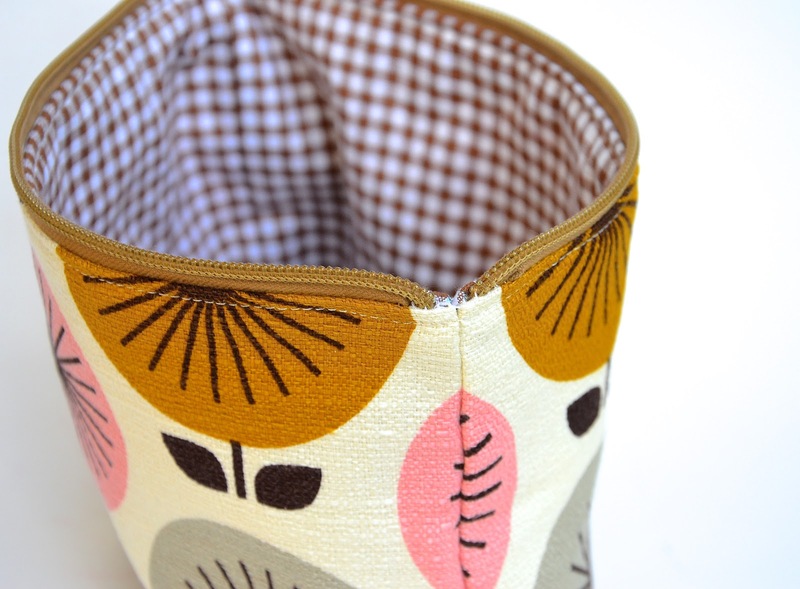 Edge-stitch around the opening of the pouch if you want to. Step 7: Let's make a fabric stop/tab now. I used two pieces of interfacing, each fused to the WS of a piece of fabric. 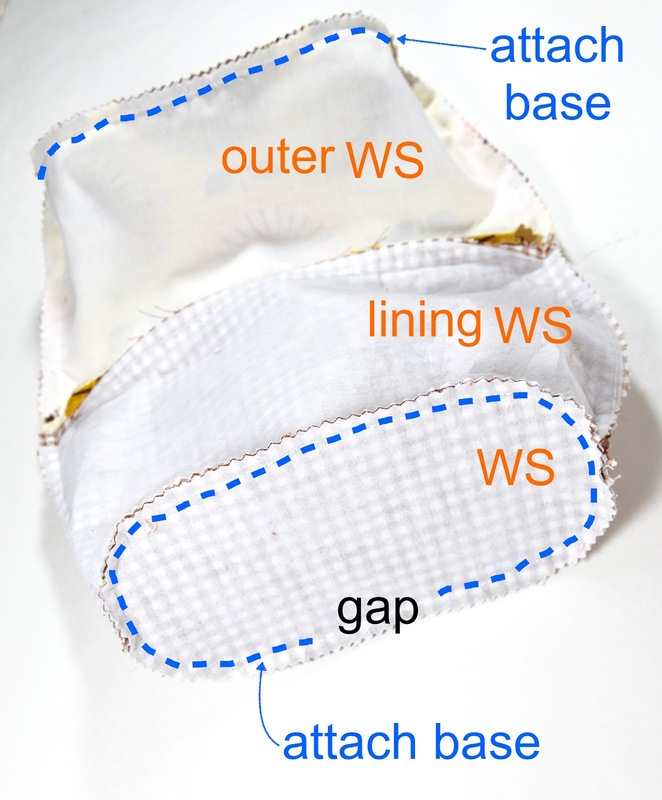 The lower edge of the fabric is extended beyond the interfacing to include a SA as shown. 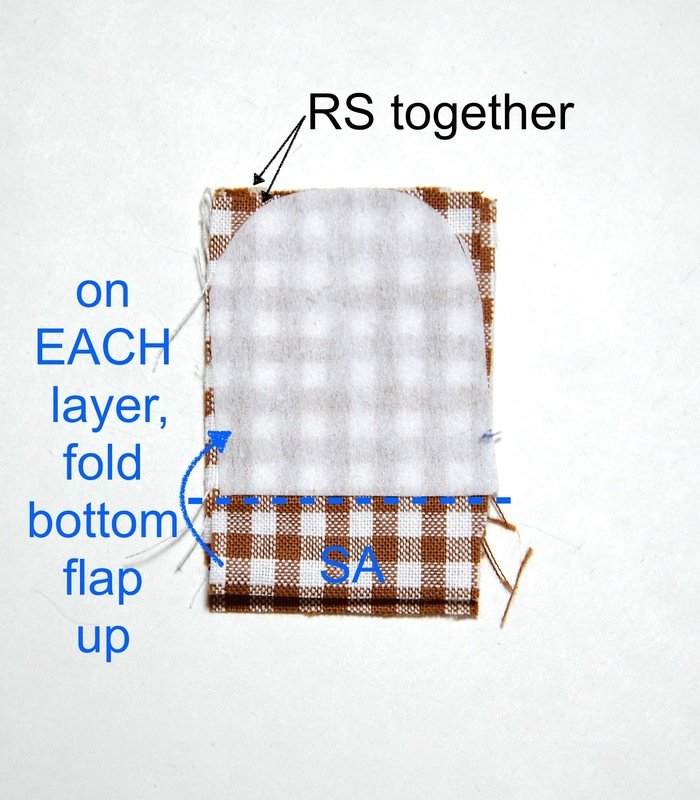 Lay the RS of the two fabric pieces together. Fold up the bottom flap (that's the SA) of each piece to touch the WS of the fabric (see next picture to visualize). 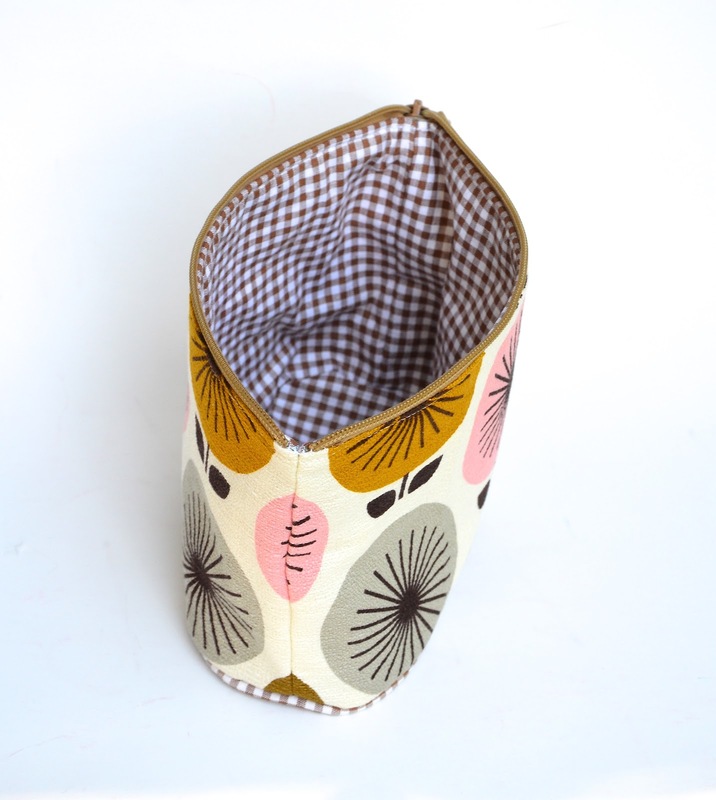 Leaving the bottom edge open, stitch around the fabric shape to create a flat pocket. 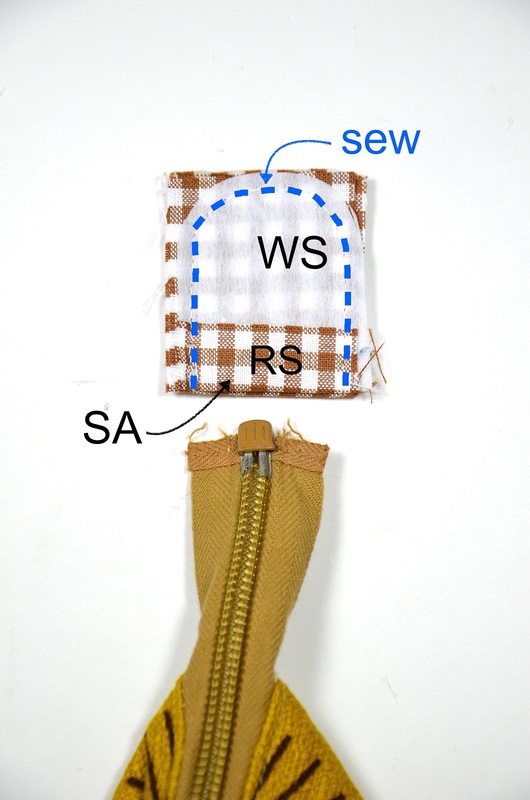 Notice how this stitching holds the bottom SA in place against the WS so that the pocket opening is finished and ready to accommodate the zipper. 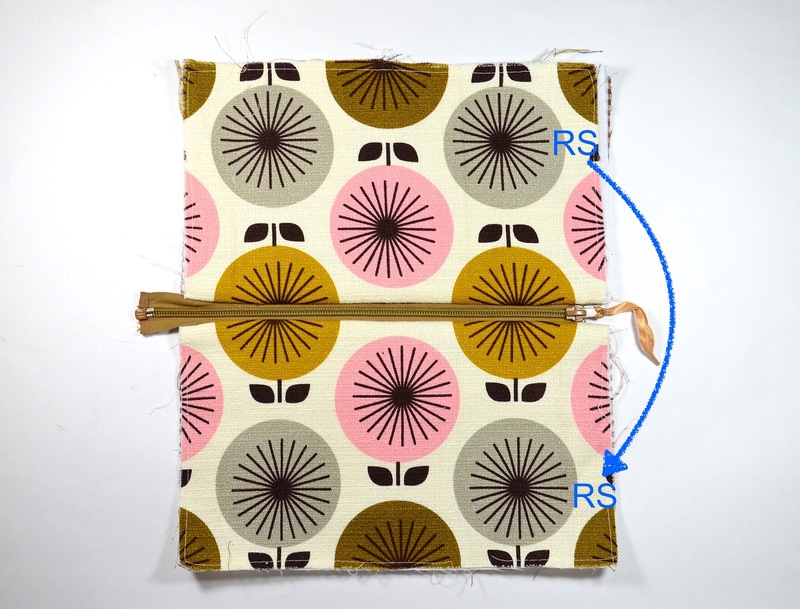 Turn the fabric tab pocket RS out and insert the zipper into it. 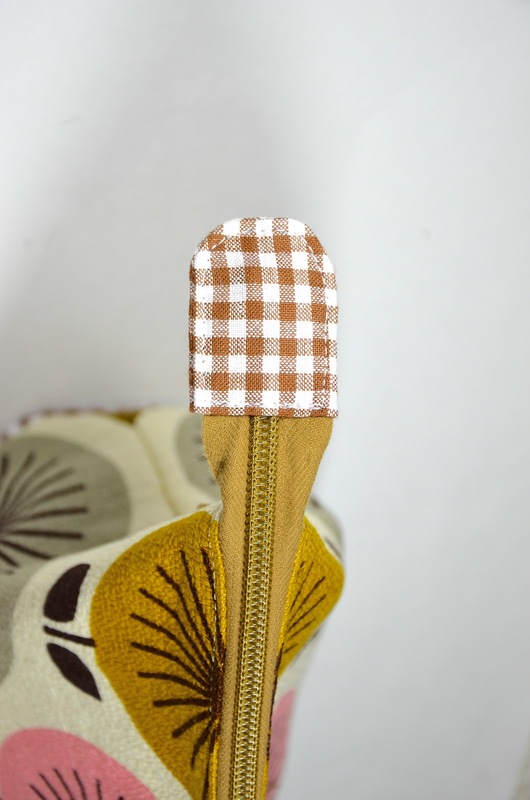 Edge-stitch around the fabric tab to secure it over the tail end of the zipper (trim off the metal hardware of the zipper tail if necessary). Here is the underside of the tab. 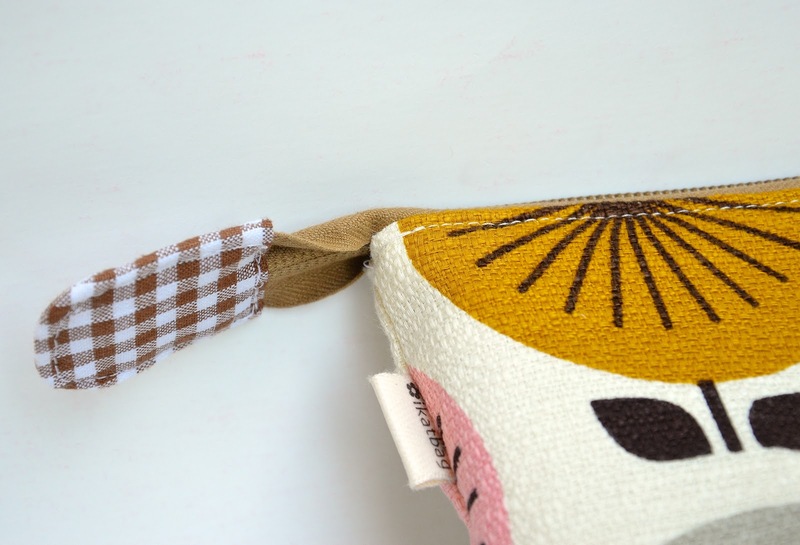 Hello--I know this isn't the point of the above post, but do you have any tips on how to make the pouch-bottom-rounded-rectangle fit into the body of the pouch? Or is it trial and error? I usually wing such things, but was wondering if there's a way to make it a bit easier. 1 Measure the stitching lines (not the actual edge of the fabric, which includes the SA, which throws the calculations off) of the base and the body's bottom opening, and make sure they match exactly. 2 Divide those two dimensions into quarters and mark the positions of the quarter marks i.e. divide the base into quarters and mark those quarter divisions., then repeat for the body's opening. 3 Match the quarter marks for the base to those on the opening. 4 Snip the SA of the opening (not the base) so the SA will fit flat around the base and allow the stitching line of the opening to come into direct contact with the exactly-identical stitching line of the base. 5 With the base below and the body on top (not the other way around), sew to attach the body to the base. I hardly ever pin or clip base to body. Don't need to (unless there are many layers of thick fabric that tend to slide around) - they always align, especially if point #1 is met. 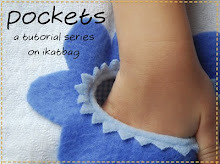 Here is a tutorial I did on sew mama sew to show exactly this. I also have trouble getting the right size base when I make a bag. 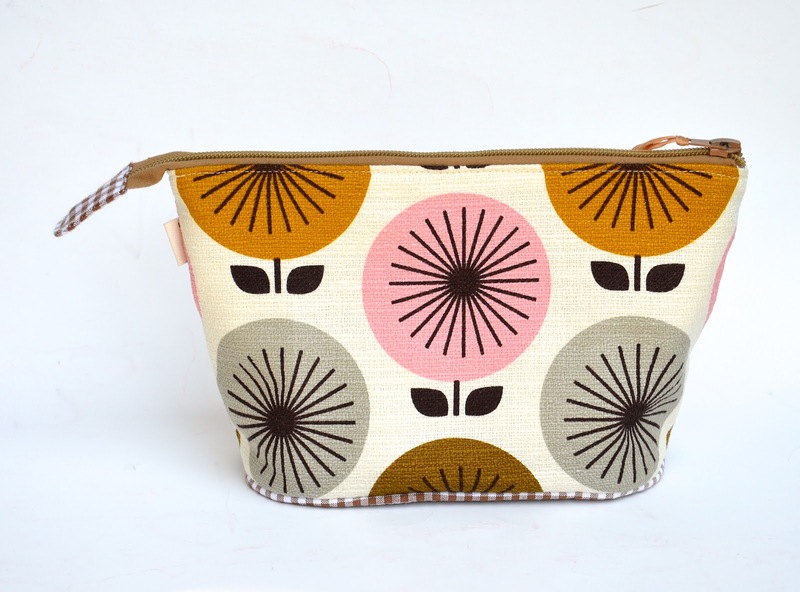 I made some yoga mat tote bags recently and it took me ages to get the right size body to match the size circle I wanted on the ends. I'm sure there's a clever maths formula to work it out, but maths was never my strong suit! The circle is easy - circumference is pi times the diameter, but I'd like to know how you drafted the oval. Cathi: draw a rectangle. Then round the corners. Wowza!! - again.... 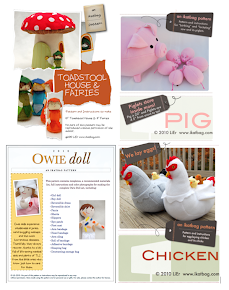 Thank you so much for these fabulous tutorials! 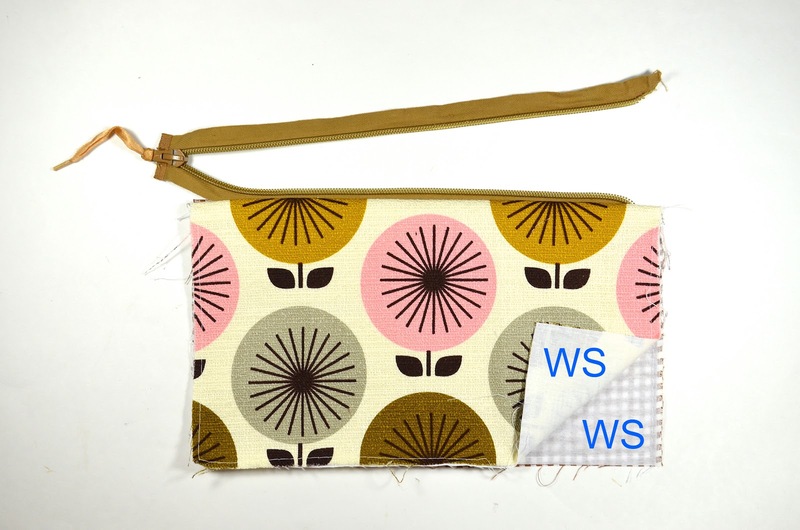 They are such a wonderful resource: I know that I'll be making lots of zipped pouches in the near future as I follow through your instructions... I see myself as a relatively confident beginner, so this is a great 'step-up'! Again, massive thanks. This series is great! Such treasures and riches. I am enjoying this series. I wondered the same thing as Bethany!